elcome to the Play-Doh Sweet Shoppe world, where you can create the craziest, most colorful pretend treats you can imagine. What will you make today? A wacky Play-Doh cake, perhaps? Or maybe a bowl of colorful pretend ice cream? 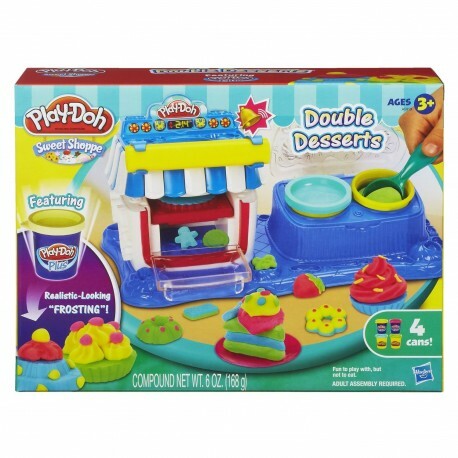 Now you don't have to decide with the Double Desserts playset! Playset base, oven, oven top, 3 oven molds, 2-piece extruder, server, scoop, roller, 2 plates, instructions, 2 cans of Play-Doh Brand Modeling Compound, and 2 cans of Play-Doh Plus compound.